Ivanovic says she's in control. WIMBLEDON – It has admittedly been a disappointing year for John Isner, which was highlighted by his 7-6 7-6 6-7 6-3 to Nicolas Almagro loss on Court 18, the very same locale that bears a plaque with his name on it. 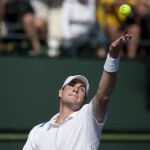 This year, however, Isner was not facing a man who is largely incompetent from the backcourt or who cannot return serves. No, Isner got to face Nicolas Mahut in the first round in 2011 in the first round over on Court 3, but on Thursday when he returned to Court 18, he had to go up against a talented yet extremely enigmatic player in Almagro. The result was not all together predictable, but the small yet muscular and fast Almagro pushed him around from the baseline, served big and yet again, but John could not find a way to break serve even once, let alone get into net enough to be a consistent force. Melanie longs to be an underdog again. WIMBLEDON – For a sport where mental toughness is frequently emphasized, tennis sure produces a drought busting amount of tears on an annual basis. Take Tuesday, when the sometimes stoic Serena Williams wept tears of joy after her 6-3, 3-6, 6-1 victory over Aravane Rezai, and the mostly contained Melanie Oudin dropped tears of sadness after another extremely disappointing performance, this one a 6-1, 6-0 defeat at the hands of Ana Ivanovic. WIMBLEDON – Serena Williams says she has no fear going into this Wimbledon. She’s been through the tread mill health wise, is now off blood thinners and while she isn’t expressing the same amount of overwhelming confidence that she usually does at Wimbledon, she thinks she is close to being very competitive. And if the four-times champion really is, she’ll be a major factor at the tournament. If Serena plays as well as she did last year, she’ll win her fifth title. She can serve and return that forcefully, which is so much of the key to success on the lawns, that she can literally knock the racket out of her opponents hands. “I felt good in my match at Eastbourne,” she said. “I still don’t feel great, but I feel good. I feel really good.” Serena bested Tsvetana Pironkova there before going down to Vera Zvonareva in a long three setter. She does not look like she in tiptop shape physically, but who would be after only a month back on court? That’s right: Serena gave herself just 21 days to prepare for Eastbourne after her doctors told her she was cleared to play. That she managed to get her game in shape to be even halfway competitive is a minor miracle considering that she was off the court for nearly a year. Yes, legends never completely lose their feel, but everyone loses some touch and rhythm and it is very rare for a player of any caliber to come back and immediately begin finding the corners. Serena is not quite there yet, but she played reasonably well in three out of the six sets she contested. But she is dedicated to getting back to where she was and for all her off court pursuits, tennis has always been her No. 1 career priority. If it wasn’t, she would never have become an all-time great. “I never thought I would miss it as much as I did,” she said. “It just takes a whole new meaning now. I don’t even know if I’ll be able to play again. Then there was a time where it was like, tennis doesn’t even matter. I just want to get healthy. Then came a point where I thought I can definitely play again. I just have to have patience…..I knew I just had to get through it.” Perhaps no one will every know what happened to Williams on that fateful evening in Germany post 2010 Wimbledon when both of her feet were cut up feet in a restaurant. Only Serena and her friends who were out with her that night know what really occurred, but at this point it doesn’t really matter. She’s been off for 51 weeks and the tour missed her very high quality play. Yes, she can be a drama queen and rubs some folks the wrong way, but she can also be charming and is without a doubt the most mentally tough and technically proficient player of her generation. It’s been fun to watch the youngsters try and make their marks while she has been off the tour, but the likes of Caroline Wozniacki and Victoria Azarenka, both who like her personally, know that if they are ever going to become big time, respected players at the majors that they have to go through Serena first. This could be a great opportunity for No. 12 Wozniacki to show that she has finally figured out which type of game she needs to employ to win a Slam, but to get to Serena in the semis, she is likely going to have to get through a tough hard-hitting group that could include Mirza, Gajdosova, Cibulkova, Goerges and possibly Sharapova in the quarters. Serena has an equally tough task with potential match-ups against Jovanowski, Kirilenko, Bartoli and any of these four: Li, Ivanovic, Radwanska or Mattek-Sands. The 29-year-old Serena is by no means on easy street yet and should not be expected to win the tournament, but because she is a player who has stood apart time and time again, she is rightfully amongst most analysts; top favorites. But who wouldn’t be a little scared of competing after suffering a pulmonary embolism and subsequent hematoma in February? Serena’s mother is afraid for her, calling her daughter a dozen times before she got on the plane to London to make sure she took an injection of blood thinners (the only time she takes them now). Yet Serena seems at peace and is raring to go. As she says, she puts on her calm athlete’s face when others quiver. She’s been taught to do that. She has learned to do that. She now tries to teach others to do that. And she can throw in a joke about it, too, which on cloudy and rainy Sunday prior to the 125th edition of the Championships, allowed her to light up a room once again.